At the prestigious Seisou Academy, students are divided into two groups: the General Ed. students and the music students. Hino Kahoko is a Gen-Ed. student who meets a Lili, a mischievous fairy that loves music and blessed the founder of the school. Lili wants Kahoko, who is the only person who can see him, to participate in the upcoming music contest, which is traditionally only for music students, and gives her a magic violin. Throughout the contest, Kahoko gains new friends in the others participating in the contest and finds a new love for the violin and for music. Kahoko Hino's high school is sperated into ordinary classes and music classes. 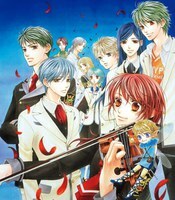 Kahoko, who is in the ordinary classes, is nominated to enter into a music contest after meeting Lily, the music fairy, who gives her a magic violin. Thus her step into the music world begins as she interacts with the other contestants.